The excitement had already set in. As we began our outbound to Rishikesh, I was a little jittery with a mix of anticipation of what was to come. After a short but sweet stint with corporate, I was glad to be back to college and the outbound was the perfect beginning for the wonderful journey that was awaiting us through the coming year. And so we began this journey with full on Bollywood masala songs at full volume while one of the Vikings played guitar in the background. 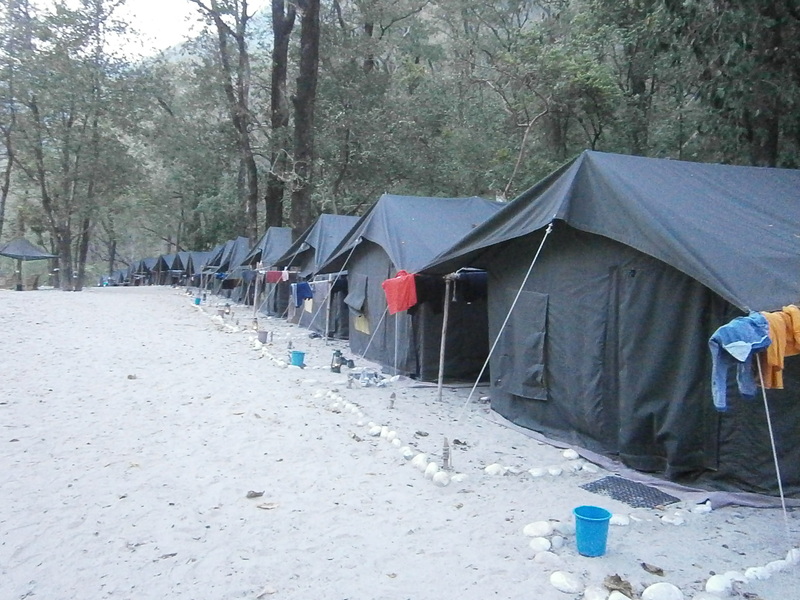 Soon the dawn doomed upon us and we reached our camp at Shivpuri. Maybe it was the sleeplessness or just plain excitement, but the view that lay ahead of us was indeed enchanting. The tiny green tents, white sand, rocks and further ahead the holy Ganges bathing in the sunlight; the surroundings were absolutely mesmerizing. It was a sight that will surely stay captured in my mind for a long time. Here, we were split into two groups with three teams each. Our group went for the rafting while the other group went for trekking and rappelling. As the rappelling group left a little early, our group had a short but stimulating game of Frisbee relay which brought us out of our sleep-deprived mode and into a geared up mode. It was Rafting time; after few instructions we were ready to face Scylla. The bone crushing force of the icy water made me feel like an action hero. The rapids made me feel as I would lose the battle, but miraculously, the instructor’s words stuck through and all of us put in our best to brave rapids. What an adrenaline rush! After a hard day’s work, the Vikings put their party shoes on at dusk and enjoyed a noisy bonfire with introductions, guitar music, stand-up comedy acts, dance and lots of songs to accompany. As the bonfire died into the night, we all went to sleep in our tents. 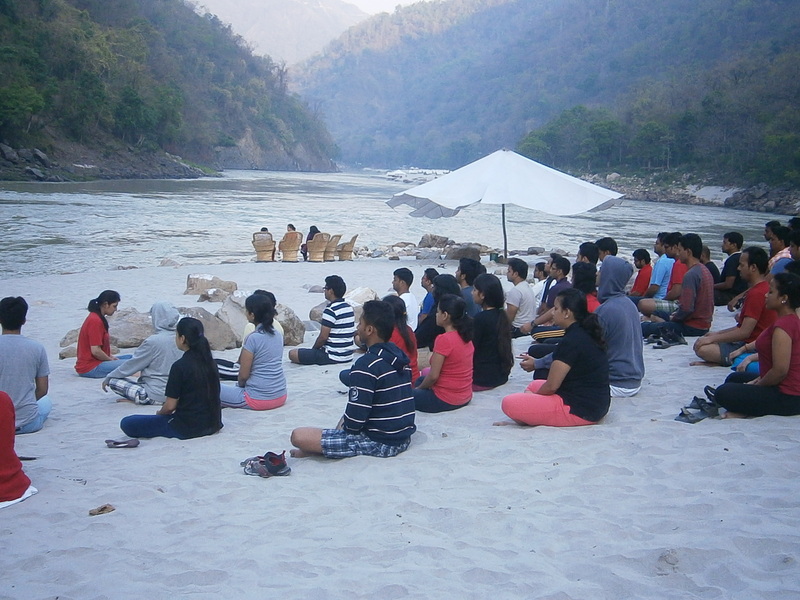 The melancholy of the Ganges woke me up at 5 AM in the morning and I participated In the a meditation session. As relaxing and peaceful as it was, still I was left wishing for some more sleep afterwards. Only after a game of hula hoop relay did the Vikings wake up from their slumber. And we got to know that the best had been saved for the last – we were having a raft building competition post which all the rafts would be judged on the basis of their performance in a race conducted on the banks of the holy Ganges. The two teams that went on to compete in the race had a photo finish end that seemed right out of a Hollywood movie. And then we had spectacular victory dance performance by the winning team! Seemed like we had just arrived and already it was time to pack-up and leave. However, once again as we left the camp, I was feeling jittery and in anticipation of what was to come. Yet one thing was very strange and very clear, we left together as individuals and after two days were returning as a group. I guess, a fast track MBA does fast track everything. I knew the last two days were a preview of how busy we would be keeping through the coming year and yet I was looking forward to my golden days. Leadership behavior in Industry and entrepreneurial ventures is beyond 360-degree exposure given to you in Business perspectives in the 4-quadrants of Technology, Finance, Marketing and Human Resource Management, in your MBA courses. Let me expose you to some leadership mantra’s in the larger domain, all starting with the letter ‘D’, for your ease of recall. Mantra #1 Dream: You should have a very strong dream of making a difference. Dhirubhai Ambani while working as a Petrol Pump attendant in Aden, Yemen did not merely nurture a dream of owning a Petrol Pump one day, or own up all the Petrol Pumps of that city or country. That was too small for him. He dreamt of owning the Upstream Industry itself wherefrom petrol was originating. He realized his dream during his life time and left >Rs 65,000 Cr. worth fortune which makes his son Mukesh the richest man in India today. “Think BIG, think AHEAD and think FAST” was his dreaming scale. Mantra #2 Direction: Dreams have to be translated into Vision, Mission, Road maps, Goals and milestones accompanied by concrete action-plans, which will have to be vigorously implemented. Continuous direction setting is crucial for success. I think, India’s Mars Mission is the best example of direction setting from planning to execution. Right from its launch from Sriharikota on 5-Nov-13 till its insertion in Mars orbit on 24-Sept-14, Mangalyan’s interplanetary journey involves several trajectory correction maneuvers, all successful so far. If ISRO succeeds till 24-Sept-14, India will be the first country to reach Mars in the first shot. Mantra #3 Decision: As leaders you will have to take bold decisions keeping far reaching implications in mind. When Jamnagar refinery, largest in the world, was being built in late nineties, Mukesh and Anil came to Dhirubhai with layout and structural drawings for approval. He asked them on what Richter the designs would be safe. They answered 6. Dhrirubhai said no, it should be designed for 9 Richter. It involved an additional expenditure of Rs 1,500 Cr. Yet he decided for it. On 26th Jan 2001, when the earthquake came with an intensity of 7.7Richter, devastating Gujrat, killing 20,000, injuring 166,000, leaving 600,000 homeless, Jamnagar Plant was standing intact, saluting the decision of Dhirubhai. Mantra #4 Determination: Fastest man on the planet, in fact a certified speed particle, Usain Bolt from Jamaica finishes his 100 m in <10 sec & 200 m in <20 sec, out of his sheer determination. He openly vows to beat his own world records of 9.59 sec & 19.19 sec respectively. No wonder, he leads the race as world’s best. Mantra #5 Dedication: Dr.V. Krishnamurthy who was Chairman BHEL, Maruti and SAIL is known for his dedication to the organizations he worked for. When he was General Manager at Tiruchi, BHEL, he was to discuss and finalize an important contract from Malaysia which turned into the first export order of BHEL. While he was doing this, his wife Mrs Rajeswari Krishnamurthy was undergoing an operation at the hospital. When he took over SAIL as Chairman in 1985, the company was in red. He called for a meeting in Bhilai Steel Plant for brainstorming on action plan; he did not reach before time as usual. He explained during his short address that though he got up very early in the morning, he went to the temple to pray God for showering his blessings on the Organization to choose the right path. He met at least 25,000 people in different sessions all over SAIL and condensed all the ideas and solutions into a booklet called “Priorities for Action” and mailed it to every executive in the company. No wonder he turned around SAIL making a profit of Rs 159 Cr in the first year itself up from Rs 4 Cr in the previous year, without increasing steel prices. SAIL never looked back during his tenure of 5-years, during which productivity per worker doubled, saluting his dedication. Mantra #6 Developing People: Five (5) out of ten (10) teams participating in IPL-2011 had Captains from “Team India” which won the World Cup-2011 under the magnanimous leadership of MS Dhoni. Sachin rightly said “Dhoni is the best captain I have played under”. Once again citing an example from the Public Sector, at one time 21 CEOs of state-owned enterprises were those who were groomed by Dr.V. Krishnamurthy. Mantra #7 Demonstration: During my 5-year term as Director General of NPTI, I and my Secretary did not avail any leave; we worked 12-hours a day against 8 stipulated including all Saturdays which used to be holidays. I may add, I had a male secretary. Watching us many of our colleagues started following stricter routines. It proved to be an historic period in the annals of the Institution making it self-sustained from a loss making entity while expanding its 4-Units to 10 across the country. It became the largest Power Training Institution in the world earning revenue more than IIT gets grant from the Government. Leadership is a Culture, a Brand; not a person. Leadership is philosophy, not a position. Leadership is behavior, not a role. Leadership is a process, not dictation. Leadership is action, not a proposition. Leadership shared is leadership multiplied. Managers manage while Leaders develop. And ….Leaders develop leaders NOT followers!